September 1, 1939 was the first day of Autumn in Europe. It was also the first day of World War II. When Adolf Hitler invaded Poland, a series of defence treaties catapulted the Allies–Britain, France, New Zealand, Australia, South Africa, Canada, Egypt, and later USA– into an inexorable confrontation with the Axis (Germany, Austria, Italy, and later Japan). One visible sign that the Unite Kingdom was at war was that key government buildings in London were fortified with thousands of sandbags, meant to absorb enemy gunfire, and protect the walls and foundations from the percussive shock of bomb blasts. Armies were mobilized, theatres were closed, night life was put on indefinite pause, and the population of Europe nervously awaited Hitler’s next move. And do you know what happened next? Nothing. For all of September Hitler did nothing aggressive so the Allies did nothing defensive. Perhaps Chamberlain had been right and Hitler, like an overfed dragon, was now appeased by the hearty chunk of Europe he had already consumed. And do you know what happened in October? Nothing. Then, November, December, January, March, and April all ticked by, uneventfully (although Norwegians would rightly decry my definition of “uneventful”). Compared to what had been anticipated after the First World War, all was quiet on the Western front. In France Edward Daladier was given near dictatorial wartime power to conscript labor, but he elected not to. Factories that could have been making ammunitions, still cranked out civilian consumer goods, food remained un-rationed, as did gasoline, ski slopes were reopened to tourists and the Cote D’Azure resorts and night clubs in Paris were soon back in full swing. French soldiers were even granted leave to go home until they were needed. In London, well into 1940, idle soldiers were seen napping on deck chairs in Hyde Park and casually feeding the ducks. King Lear was still on show.The Times newspaper had nothing to report about the war and turned it’s attention to the return of migrating swallows and cuckoos to the British Isles. Alfred Duff Cooper made his fatuous announcement to an American audience that Britain and France had, “found a new way to make war without loss of human life.” One unpopular Cassandra was Winston Churchill, who passionately warned the Allies not to be lulled into a false sense of security. And then, one day in May 1940, after nine months of almost no action… something ominous occurred in London: the sandbags, which had fortified the walls of government buildings, all began spontaneously to burst. You see, instead of being filled with coarse sand as the contracts had stipulated, the bags had been cheaply stuffed with common earth. Tiny seeds in the earth had now begun to sprout green shoots of various plants, thus bursting the sandbags. What did this mean for the war? Well, the reason the seeds were sprouting was because it was now Springtime. The green shoots meant that Summer was approaching. Hitler, who knew his history well, had learned from Napoleon’s fatal blunder: you never start fighting in Winter, when your resources are limited. If Napoleon had waited til Summer, many Russians might today be French-speaking. 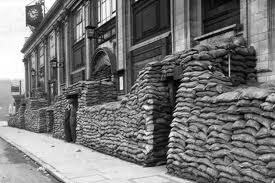 The verdant saplings in London’s sandbags were the harbinger that the war was about to begin in earnest. Sure enough, the next communique from France to #10 Downing Street was a panicky telephone call from the French Prime Minister declaring that France had fallen. And the rest is, as they say…history. The lesson we learn is that when sandbags sprout leaves, run for the hills. Believe it or not, that is exactly what Jesus said in Luke 21:29-31 And he told them a parable: “Look at the fig tree, and all the trees. As soon as they come out in leaf, you see for yourselves and know that the summer is already near. So also, when you see these things taking place, you know that the kingdom of God is near. The point Jesus made with such punch was that if you are smart enough to recognize that sprouting leaves precedes Summertime, then you ought to be alert to the signs of his own imminent ETA. Remember what these signs are? Luke 21:25 “And there will be signs in sun and moon and stars, [cosmic instability] and on the earth distress of nations in perplexity because of the roaring of the sea and the waves, [tsunamis] 26 people fainting with fear and with foreboding of what is coming on the world. For the powers of the heavens will be shaken [Google what a near miss with a comet would do to the earth’s axis and the resulting global affects]. Other signs Scripture predicts include: wars and rumors of wars, earthquakes, outbreaks of deadly disease, and famines (economic collapse). Obviously, these signs are a little more disconcerting than the signal that it’s Summertime. Therefore, many people don’t see these events as good news. Instead they try to stop it, they try to fix it. If the Discovery Channel is anything to go by, it seems experts are incessantly meeting to discuss ozone depletion, global warming, the El Niño effect, a coming ice age, and the likelihood of meteors or sunbursts or viral outbreaks or nuclear fallout destroying our planet. Do you know what’s the biblical response to these doomsday predictions? Cheerfulness. Luke 21:28 Now when these things begin to take place, straighten up and raise your heads, because your redemption is drawing near. Every generation believes they are in the end times. I think this is healthy. This is why God allows the foreshocks to rock our complacency: so we will be alert and live like we believe Jesus is coming back. If we lived in a Utopian world that had somehow curbed overpopulation, eradicated earthquakes, discovered the cure to every disease, tamed the oceans, erected a force field around the planet, and attained total and abiding world peace among all nations… then we would understand why people doubt Jesus’ words. 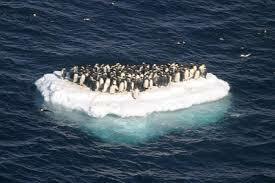 But friends, when our world shows signs of nearing its expiry date, Christians should take heart. The foreshocks prove the prediction. These are not times to be lax and lethargic, of lazing on deck chairs and feeding the ducks. ‘Tis the season to be ready.